Banh cha is one of the popular snacks in Hanoi. Banh cha is not only a simple Hanoi street food, it is the small gift of flavor at the beginning of a new year. In the past, on the New Year’s Days, Hanoians often offered the guest visiting their house with banh cha and cups of hot lotus tea. 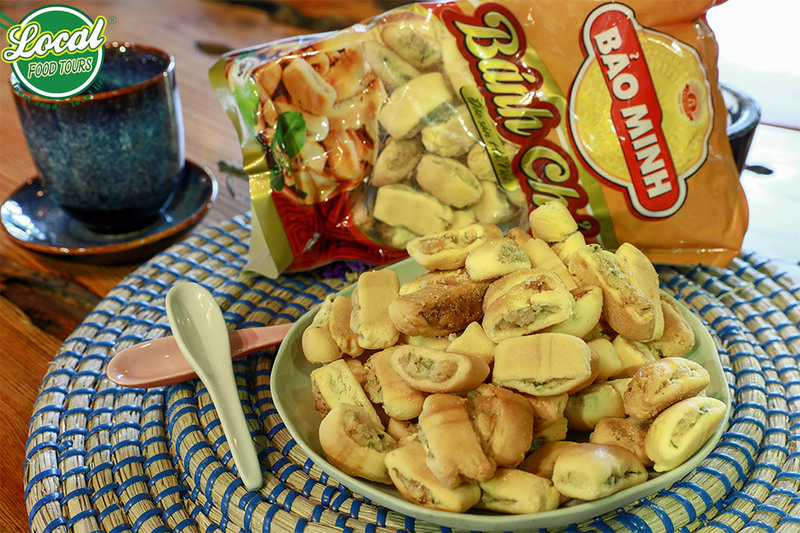 Unlike any other kinds of snacks, at that time banh cha seemed to be at different level. It is called “cha”, which means the grilled meat balls, because the small pieces of golden brown cake remind people of the meat balls on the red charcoal oven. The ingredients for making banh cha are almost similar to those of the moon cake, but they are simpler. All you need are fat, lime leaves, sugar, salt, flour, glutinous rice flour. However, if you want to make the true flavor of this Hanoi traditional food, all selected ingredients must be fine and high-quality. The main ingredient helping to create the taste of banh cha is pork fat. The fat must be taken from the pork loin, after being washed, the fat loin is blanched quickly with boiling water to make it firm. When it is drained, the fat will be diced, then mixed with sugar. To help the people who love making sweet deserts in general and banh cha in particular, the traditional cake makers do not hesitate to share with the learners of cooking class in Hanoi the secret to make the fat more elastic. They put a little bit of glutinous rice flour into the mixture of fat and sugar. The fat must be marinated in sugar for 10 days or more depending on the weather condition to make them perfectly harmonious. Nowadays, people may add lap xuong (or Chinese sausage) into the fillings of banh cha to adorn the cake with light red color and flavor the cake with sweet taste as well. If fat is the decisive ingredients for taste, lime leaves is indispensable for the specific smell of banh cha. To have the leaves for the cake throughout the year, the makers have to order from the “wholesalers”. Lime leaves are washed and rinsed carefully. After that, the leaves will be shredded. The skillful makers shred the leaves into thin threads to prevent the acrid taste of them from making the cake bitter. The shredded leaves are mixed with the sugary fat and a little bit salt and then stir-fried. The coat covering the tasty fillings is made of wheat flour. People knead the dough well then roll it into the thin rectangle layer of 3mm. The fillings that precisely prepared will be spread on one long edge the dough layer and rolled. The roll of cake is divided into lots of small pieces. To put on them the golden costume, the makers coat them with the beaten egg yolk. Instead of pouring the egg on their surface, the maker are patient to spread the liquid on the cakes’ surface with the brush. Too much egg will spoil the scent of the cake. Finally the lovely pieces of banh cha are put into the stove. After 20 minutes, with the suitable heat, banh cha turns golden brown and smells alluringly. Banh cha is now packaged and becomes a gift for people who come from any place in the world. You can buy this specialty when you come back to Hanoi after the Vietnam food tour. Or if you join Hanoi local food tours, you may be invite some of banh cha with a cup of hot tea. The flavors and odors of them will mingle and leave the deep impression in your memory.